What Can AC Maintenance Do for You? We have no shortage of hot and humid summer days. You know very well that the last thing you want to do is face one of these days without a functional air conditioner. But that’s what can happen if you skip maintenance! Did you know that about 85% of the repairs that an air conditioner might need during its lifetime are problems stemming from lack of maintenance? 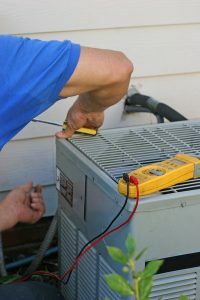 Investing in maintenance and cutting out those repair needs saves you money, as well as time and needing to cope with the summer heat while the air conditioner isn’t working. This benefit alone pays for routine maintenance costs many times over. This isn’t the only way you can save, either. Maintenance protects your cooling system from wearing down, lessening the strain it puts on your electrical system. A neglected AC system is an AC system that wastes energy and raises utility bills unnecessarily. Staying up to date on maintenance will help your cooling system retain 95% of its original efficiency rating throughout its service life. And, speaking of that service life, an air conditioner is less likely to need a premature replacement if it is regularly maintained. So long as it is properly cared for, the typical air conditioner will last 10-15 years. Without maintenance, that number drops to about 8 years. What Does the Manufacturer’s Warranty Say? One final reason you should get maintenance done every year? Because the manufacturer’s warranty may call for it. If your air conditioner doesn’t get this routine care, it might void this warranty, meaning you could get stuck with a large repair or replacement bill for a faulty air conditioner. On that note, about 2% of air conditioners leave the factory with some kind of fault. Maintenance ensures that your system is clean and functioning as efficiently as possible. It also helps our technicians spot repair needs before they grow into bigger emergencies. For expert AC services in Gainesville, FL and beyond, contact North Central Florida Air Conditioning today. We’re improving lives by improving homes!